FOUNTAIN VALLEY, Calif., June 19, 2017 – Driving the most fuel efficient vehicle in America doesn’t mean you have to compromise on its appearance as the 2017 Hyundai Ioniq received the 2017 Green Good Design Award™ from the Chicago Athenaeum: Museum of Architecture and Design and the European Centre for Architecture Art Design and Urban Studies. The Green Good Design Awards™ celebrate important examples of sustainable designs and provide awareness on what companies are designing and producing to make the most positive impact on the environment. For 2017, 100 designs were awarded Green Good Design Awards from 23 nations. 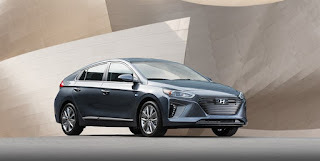 The Hyundai Ioniq was recognized among the world’s most advanced products, designs and projects representing leading companies that have an emphasis on sustainability. The thoughtful and innovative work by Hyundai’s design teams helped Ioniq become recognized as one of the best ecological and sustainable designs in transportation for 2017. Now in its eighth year, Green Good Design Award™ is a specialized edition of the original the Good Design™ program. Ioniq is the first eco vehicle in the world to offer three distinct electrified powertrains on a single, dedicated vehicle platform – the Ioniq Hybrid, Plug-in Hybrid and Electric models. Hyundai’s Ioniq line-up calls upon two key factors, efficiency and technology, in its design, which combine to create both a unique and forward-looking appearance. Throughout the entire development phase, engineers and designers worked closely to ensure that form and function evolved simultaneously in a complementary fashion. Distinguished exterior design sets Ioniq apart from its competitors as advanced technologies are integrated with the overall design. Ioniq Hybrid is the most fuel-efficient vehicle and the Ioniq Electric is the most efficient electric vehicle in the U.S. market. THE CHICAGO ATHENAEUMThe Chicago Athenaeum (www.chi-athenaeum.org) is a global nonprofit education and research institute supported by its members. Its mission is to provide public education about the significance of architecture and design and how those disciplines can have a positive effect on the human environment. THE EUROPEAN CENTRE FOR ARCHITECTURE ART DESIGN AND URBAN STUDIESThe European Centre for Architecture Art Design and Urban Studies (www.europeanarch.eu) is dedicated to public education concerning all aspects of the built environment - from entire cities to individual buildings - including the philosophical issues of arts and culture that ultimately give the final shape to design. A high emphasis exists on contemporary values and aesthetics, conservation and sustainability, and the theoretical exploration and advancement of art and design as the highest expression of culture and urbanism. FOUNTAIN VALLEY, Calif., June 16, 2017 – An impressive streak in customer loyalty continues for its eighth year in a row, as Hyundai is again ranked No. 1 in the automotive industry in the Brand Keys Customer Loyalty Engagement Index. Brand Keys, a New York–based customer loyalty and engagement consultancy, publishes this annual syndicated study, which examines customers’ relationships with 740 brands in 83 categories. For the Brand Keys 2017 survey, nearly 49,168 respondents self-selected the categories in which they are consumers and the brands for which they are customers. Brand engagement measures rational and emotional aspects of the categories to identify how well brands meet expectations that consumers hold from consideration to purchase. Brands that best meet consumers’ expectations generate the most loyalty. 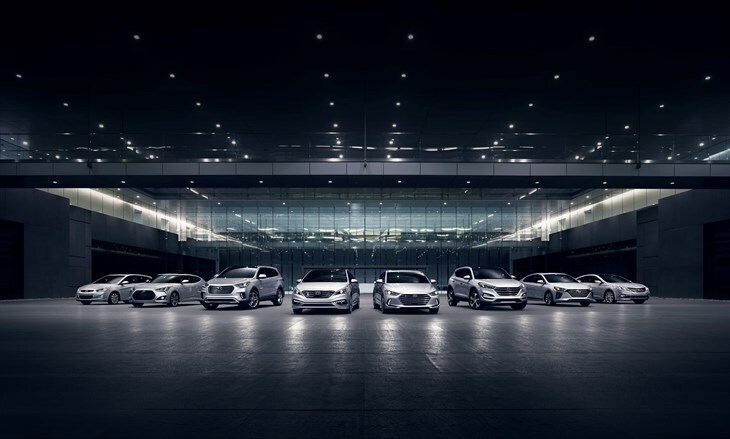 Hyundai has built and maintained a loyal customer base thanks to its diverse and dynamic lineup that meets the needs of a variety of customers. From its family of SUVs to its fuel-efficient and technology-filled sedans to the all-new eco-focused Ioniq, Hyundai’s product lineup continues to deliver across a wide -range of segments. All of these vehicles come packed with standard safety features and are backed by Hyundai Assurance. 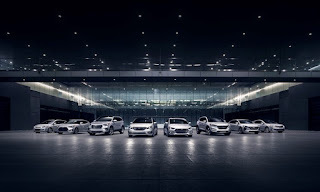 Hyundai Assurance is the industry’s leading owner satisfaction program that includes America’s Best Warranty (10-year, 100,000 miles powertrain limited warranty), five-years of complimentary roadside assistance and Blue Link Connected care services free for one year. 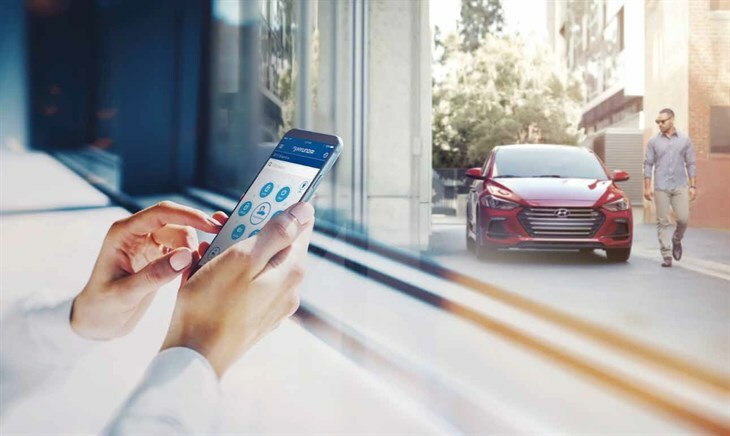 Hyundai also continues to improve satisfaction in purchase process, with offerings like the new Ioniq Unlimited+ electric vehicle subscription program that provides Ioniq EV customers in California with one fixed monthly payment that includes unlimited miles, scheduled maintenance and electric charging reimbursement, among other features. 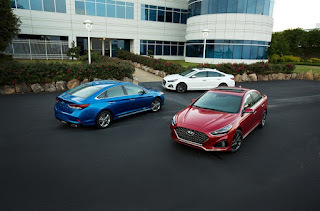 FOUNTAIN VALLEY, Calif., June 14, 2017 – The 2018 Hyundai Sonata, with a dramatic new exterior design, an impressive list of standard safety features, and a new eight-speed automatic transmission in 2.0T models, once again sets the standard in the mid-size sedan segment. Pricing throughout the lineup delivers consumers a compelling choice, starting at $22,050 for the Sonata SE. The 2018 Sonata arrives in dealer showrooms this summer. Freight charge for the 2018 Sonata is $885. Created at Hyundai’s California Design Studio and assembled at Hyundai’s manufacturing facility in Montgomery, Alabama, the 2018 Sonata builds on the model’s strong legacy. Distinctive new exterior styling transforms Sonata’s visual signature. The dramatic new appearance is highlighted by Hyundai’s bold new “cascading grille” in front and an all-new rear with more prominent branding and relocation of the license plate in the bumper. New sheet metal for the sculpted hood, front fenders, and trunk makes the dynamic new look possible. In addition, redesigned alloy wheels (16, 17, and 18-inch) and distinctive illumination from vertical LED DRLs, LED headlights, and LED taillights further highlight the assertive and advanced exterior design. Inside, the renewed center stack and instrument panel now create more visual dimension and add a premium feel to echo the exterior’s eye-catching new looks. Changes in the cabin include a sporty three-spoke steering wheel and piano-key buttons for the audio and HVAC controls, while the standard seven-inch color display audio system is prominently displayed. The current Sonata has been well received by owners for its ride and handling, and Hyundai engineers further refined the chassis for 2018. To achieve this, the rear suspension receives 21 percent thicker trailing arms to better manage heavy suspension loads, while new bushings allow for more ride compliance and quicker response times. The steering system’s torsion bar stiffness has been increased by 12 percent to improve steering responsiveness and new steering calibration further improves on-center feel. The top-of-the-line 2.0T engine is mated to a new eight-speed automatic transmission, which adds ratio range at both the top and bottom for improved performance and efficiency. All 2.0-liter turbo Sonatas ride on 18-inch wheels wrapped in Michelin tires. Adding to an already impressive list of standard safety equipment, every 2018 Sonata is equipped with Blind Spot Detection (BSD) with Rear Cross-Traffic Alert (RCTA). The Sonata is the only mainstream mid-size car sold with this safety technology as standard equipment. Working in conjunction with the standard rearview backup camera, RCTA gives drivers peace of mind that the road behind them is clear. Furthermore, the available Lane Departure Warning system is now enhanced with Lane Keep Assist function. All 2018 Sonatas are equipped with a standard seven-inch color display audio touchscreen with both Apple CarPlay® and Android Auto® integration. Models equipped with Blue Link Telematics get three years of complimentary Connected Care and Remote services; including the ability to activate many of the features using the Amazon Echo and Google Home virtual assistants. The available navigation system is enhanced with a bird’s-eye-view feature and HERE HD real-time traffic flow data. Furthermore, the inconvenience of outdated map software is now a thing of the past as owners now have three years of complimentary Guidance Package services, which include downloads to maintain up-to-date navigation programming. For complete pricing and packaging details, please visit http://www.hyundainews.com/us/en/models/sonata/2018/pricing. 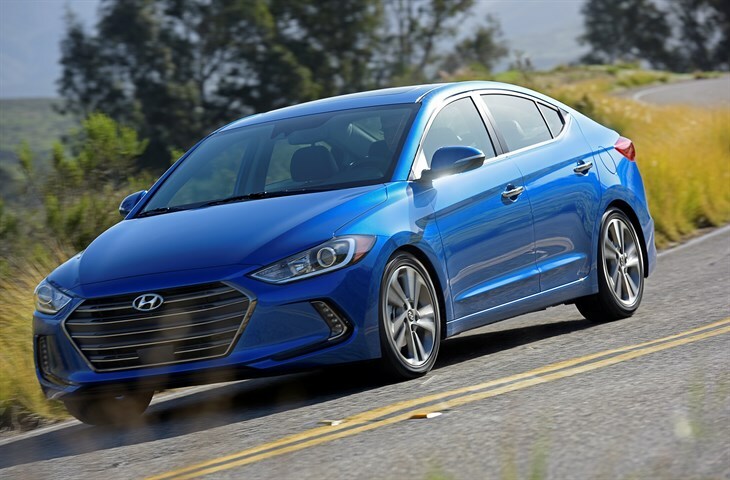 Now in its sixth generation, Elantra has achieved more than 2.9 million sales since its launch in the U.S.
Hyundai Blue LinkHyundai Motor America is going above and beyond the competition by offering three years of updated standard Blue Link services for available 2018 Hyundai vehicles and 2017 IONIQ models. June 13, 2017 – Hyundai Motor has unveiled the latest vehicle in its expanding line-up of stylish SUVs, the Kona compact SUV. With a strong, impactful design and uncompromised individuality, the Kona is designed to appeal to modern customers with active lifestyles. The Kona joins Tucson, Santa Fe and Santa Fe Sport in a growing line-up of Hyundai Motor SUVs, as the company continues to widen customer choice in the segment. At the world premiere of its new B-segment SUV, Hyundai Motor reaffirmed its promise to deliver SUVs that feature progressive design with high interior refinement and spaciousness. The Kona will go on sale in Korea later this month, followed by North America and Europe. Uncompromised individuality and purposeful characterThe Kona is a brand-new challenger in the B-SUV segment, with uncompromised individuality and innovative features. The Kona’s bold, daring image hints at the future design direction of Hyundai Motor’s next generation of SUV models and creates a unique proposition in the compact SUV segment. Kona stands out from the crowd with high contrast design elements and striking style. Its masculine protective, ‘armor’, combines powerfully with the futuristic LED lighting to create a high-tech look. Despite its unique appearance, the Kona doesn’t sacrifice sophistication and is highly capable – a combination designed to appeal to the Millennial demographic. Unique and stylish exterior designThe Kona’s stand-out design is reinforced by the car’s voluminous, aggressive body styling, that emphasizes the car’s well-proportioned, dynamic silhouette. Its low and wide stance complements the car’s stylish profile, with the long wheel base and short overhangs ensuring sporty, nimble handling, in addition to delivering superior driving stability at high speed. ‘Composite lamps’ enhance the Kona’s high-tech and mechanical appearance. The slim daytime running lights (DRL) incorporate turn signals and are positioned in a ‘stack’, separate to the LED headlights. The Kona’s front is powerful, as its ‘armor’ shows its readiness for extreme activities. The compact SUV also adopts Hyundai Motor’s new family identity, the Cascading Grille, featuring a sporty mesh pattern, flanked by exceptional wing-type fenders that dominate the front design. The visual relationship between the composite lamps, Hyundai's signature Cascading Grille and the unique armor design results in a totally distinct character, which is important in the increasingly competitive B-SUV segment. Further stand-out design elements at the side reinforce the car’s tough and functional qualities. Most notably the contrasting black ‘armor’ that provides a protective skin and visually connects the front to the rear. As with the front LED arrangement, the rear light configuration also creates a truly unique signature appearance. The slim brake lights, turn indicators and reverse lamp are placed in a separate configuration, surrounded by protective skin that begins at the C-pillar garnish. In addition to the instantly recognizable shape, a number of playful color variations allow buyers to customize their Kona. The roof is finished with a two-tone color scheme, providing high contrast between the body and wheels – satisfying customers with a desire to express their individuality. Spacious interior delivers comfort and convenienceThe unique features of the exterior continue inside, with a strong horizontal character line creating a wide and spacious feel. Even with its compact dimensions and low roof line, the Kona delivers best-in-class interior space. The sleek and simple layout interior contrasts with the bold, adventurous exterior design. The AVN (Audio, Visual, Navigation) monitor incorporates Hyundai Motor’s advanced infotainment features. The monitor appears to float on the dashboard, contributing to the sense of openness. The mechanical air vents and functional button arrangement reflect the high-tech functionality of the exterior. The AVN and HVAC (heating, ventilation and air conditioning) controls are surrounded by soft, fluid details that contribute to a sensuous experience and enhance the comfort-focused environment. The all-new compact platform has been developed to provide customers with a true SUV experience. SUV-level ground clearance and an elevated seating position ensure better visibility for drivers and increases comfort on long journeys. Kona offers occupants generous interior space by optimizing the underfloor layout, including the 4WD drivetrain and exhaust system, to reduce central tunnel intrusion. The suspension component layout is optimized at the rear, allowing for a lower floor and seating position to deliver class-leading levels of headroom and ease of access for rear occupants. Designers also optimized interior space to maximize luggage storage capabilities, reflecting the requirements of customers with active lifestyles. The split-folding rear seats fold flat, with a two-level loading floor that allows easy access for a bicycle or golf club storage. 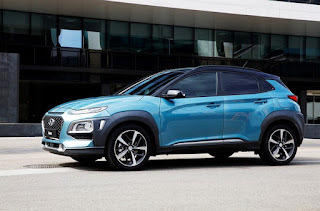 All-new platform delivers exceptional power and performanceWith an all-new compact SUV platform developed for the Kona, Hyundai Motor looks to set new performance standards for the compact SUV segment. The powertrain layout is optimized to create a compact platform capable of incorporating the car’s four-wheel-drive system while maintaining interior space. The Kona blends exceptional fuel efficiency with a fun urban driving experience, delivering power and performance levels that are not often found in vehicles in its segment. The range of small-displacement turbo-charged petrol engines and diesel powertrains deliver a dynamic driving experience for nimble, easy motoring. The new Kona is offered with a combination of gasoline and diesel engines of various power outputs – dependent on the market. A 2.0-liter MPI Atkinson engine produces 149PS, with a 0-100km/h time of 10 seconds and a top speed of 194km/h. Paired with a six-speed automatic transmission, the engine delivers maximum torque of 179 NM (13.8 kgf · m) at 4500rpm. The Gamma 1.6T-GDI engine boasts 177PS, a 0-100km/h time of 7.7 seconds and a top speed of 210km/h. The engine delivers maximum torque of 265NM (27kgf · m) from 1,500 to 4,500rpm and is mated to Hyundai’s efficient and responsive seven-speed dual-clutch transmission (7DCT). In addition to the 1.6T-GDI engine, customers in Europe can also opt for Hyundai’s downsized 1.0 T-GDI turbocharged three-cylinder engine with six-speed manual transmission. This turbo-charged powerplant is optimized for efficiency and produces 120PS, a 0-100km/h time of 12 seconds, top speed of 181km/h and maximum torque of 172NM (17.5kgf · m) from 1,500 to 4000 rpm. Also available will be a 1.6 diesel engine for select markets, including Europe. The newly-developed SUV’s chassis is engineered to be rigid, topped with a lightweight body for dynamic driving performance and a comfortable ride. The platform is optimized to permit SUV levels of ground clearance, while the optional 4WD system and drivetrain is intelligently packaged to offer a spacious interior despite its compact proportions. To integrate the optional four-wheel drive system, Hyundai Motor engineers created a new intercooler layout and setting for the transmission to minimize intrusion into the cabin space. The rear layout of the platform is also optimized to save space. The suspension, fuel and exhaust components carefully package to maximize rear occupant room. The front suspension features a McPherson strut system, receiving a new sub-frame bush mounting and best-in-class tire trace to enhance comfort and reduce NVH. The system incorporates SUV geometry for refined body movement on rough roads or harsh off-road terrain. Different rear suspension systems have been developed for both 2WD and 4WD, to deliver a comfortable ride and sporty handling with either drivetrain. At the front, the rear subframe receives new bush structure for the 2WD suspension set-up, with a high-stiffness torsion beam for greater stability and control. The 4WD configuration features a dual-arm multi-link suspension system to refine overall driving dynamics on all surface types. Strong and protective body for passenger safetyHyundai Motor is the only car manufacturer to make its own steel to produce its vehicles globally, providing great benefits for the Kona. The lightweight body frame has been developed with 51.8% Advanced High Strength Steel to deliver class-leading levels of passive safety. Hot stamping methods produce lightweight, super-strong structural elements to maximize the cabin’s central safety zone. This proves that small cars can deliver exceptional passenger protection. The length of structural adhesives used in production extends to 114.5 meters, providing additional torsional rigidity and further reducing weight – which also benefits fuel efficiency. The platform also features an innovative multi-load path structure – an advanced energy dispersion technology that boosts impact tolerance by dispersing crash energy across multiple structures to protect passengers in the event of an accident. Class-leading driver assistance through active safety systemsHyundai Motor sets out to care for its customers in all of its activities. The new model showcases Hyundai Motor’s capabilities and commitment to enhancing the safety of drivers, passengers and fellow road-users. Class-leading active safety features include Forward Collision-Avoidance Assist (FCA), which uses the car’s front-facing camera and radar to detect imminent collision and avoid impact or minimize damage by braking autonomously. Three further systems also utilize the front-view camera to boost safety and convenience: Lane Keeping Assist (LKA); High Beam Assist (HBA); and Driver Attention Warning (DAW). By sensing road markings, Lane Keep Assist helps to prevent accidental lane departure by steering the car automatically if required. High Beam Assist automatically controls the high beams depending on surroundings, while the Driver Attention Warning system monitors a spectrum of driver-related characteristics to detect driver fatigue or careless driving. The car’s radar systems also assist with the Blind-Spot Collision Warning (BCW) to detect approaching vehicles that may be obscured from view during high speed driving. The Rear Cross-Traffic Collison Warning (RCCW) detects when another vehicle may have entered the car’s reversing path. Advanced infotainment and connectivity technologyThe Kona boasts a suite of sophisticated technologies, paired with user-friendly functionality to ensure driver and passengers can stay informed and entertained. The premium infotainment system offers various advanced connectivity features, including Android Auto and Apple CarPlay where specified with a 5-, 7- or 8-inch display (offered as standard or option dependent on market). Further options include DAB digital radio (Europe), HD Radio (North America), rear view camera display, and 4G telematics (North America) to ensure absolute connectivity. A new combiner Head-Up Display (HUD) is fitted to the Kona, projecting a virtual image onto the clear glass panel mounted behind the instrument panel to enable the driver to keep his or her eyes on the road. With a projected image size of eight-inches at a two meter distance and class-leading luminance of more than 10,000 candela per square meter, the Kona’s combiner HUD ensures both excellent day- and night-time visibility. Information projected to enhance safety and usability include speed, navigation instructions, Lane Departure Warning messages, and audio information. Deployed vertically by a simple touch of a button beside the steering wheel, the combiner disappears into the dashboard when not in use. Enhanced driving dynamics for urban and off-road funThe Kona was developed with a focus on enhanced driving dynamics and responsive performance for city driving. The wide, long wheelbase and short overhangs create a planted stance that results in exceptional agility in busy urban environments and enhanced stability when driving at speed. The three differentiated driving modes (Sports, Normal and Eco) optimize the torque distribution and gear-shift settings to make the compact SUV suitable for all driving style requirements. In Sport mode, there is a greater emphasis on acceleration with early downshift on braking, while Eco mode optimizes fuel economy over performance with longer gear ratios. The Kona nameHyundai Motor continues the approach established by Tucson and Santa Fe of naming crossover and SUV models after acclaimed travel destinations. The Kona is named after the coastal region on the Big Island of Hawaii, USA. The Kona region is famous among thrill-seeking travelers and the island’s energetic image is reflected in the innovative, practical and highly functional design of Hyundai Motor’s new lifestyle-focused SUV. Kona Iron Man Special EditionAt the world premiere of the all-new Kona, Hyundai Motor unveiled a special edition that shares the name of the Marvel’s heroic and powerful character – Iron Man. The Kona’s design is inspired by the strong, armored appearance of the Iron Man suit, with its powerful lines echoing the sensual body of the comic and cinematic hero. Again, aligning its characteristics with the technologically advanced Stark Industries armored suit, the Kona Iron Man Special Edition majors on safety and advanced technologies. With greater width (+40mm) the Kona Iron Man Special Edition presents a confident stance while suggesting a voluminous interior. Further visual enhancements set apart the Iron Man edition from the standard Kona. Special LEDs are applied to the headlights, which sit beneath a matt grey hood, embellished with red and gold accents. The Kona Iron Man Special Edition’s dynamic exterior is further complemented by a 19-inch directional wheel badged with an Iron Man Mask in the center as well as off-road tires 716mm in outside diameter. The special edition will go on display at Hyundai Motor’s Motorstudio in Seoul, Korea for a month following its global reveal. About Hyundai MotorEstablished in 1967, Hyundai Motor Company is committed to becoming a lifetime partner in automobiles and beyond. The company leads the Hyundai Motor Group, an innovative business structure capable of circulating resources from molten iron to finished cars. Hyundai Motor has eight manufacturing bases and seven design & technical centers worldwide and in 2016 sold 4.86 million vehicles globally. With more than 110,000 employees worldwide, Hyundai Motor continues to enhance its product line-up with localized models and strives to strengthen its leadership in clean technology, starting with the world’s first mass-produced hydrogen-powered vehicle, ix35 Fuel Cell and IONIQ, the world’s first model with three electrified powertrains in a single body type.